Island Goode's example CSA share. Island Goode’s CSA is owned by Garvin and Laura Goode and operates through their Goode Enterprises Inc. Company. The farm is located on the Hilo-Hamakua Heritage Corridor on Rt. 19 just north of Papa’ikou. The Goode’s farm encompasses 5 very fertile acres at the 400 foot elevation just off the highway, and has been in operation since 2004. 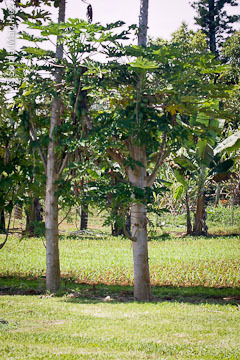 Although not certified organic, the Goodes generally practice organic methods by fertilizing with donkey manure (their 2 donkeys are part of the Kona Nightingale Rescue Project), plus tilapia fish waste water and “Green Alga Technology” which is gravity fed through an open-flow distribution system to their three 20’x50’ greenhouses and some of the field crops. “I am the only one that I know of who is using what I call ‘Green Alga Technology,’ ” explains Garvin. “You can see this explained on our Facebook page” (see Wall post for Sept. 16, 2010). New sweet corn crop sprouting between rows of papayas and bananas. The Goodes consider their ‘kea’ or white corn their anchor crop in both spring and fall. I can attest to the deliciousness of their corn, which is so tender and sweet it barely needs cooking. The beauty of their corn is that contrary to what you hear about corn in general (“from stalk to pot as quickly as possible”), the kea variety can be stored in the refrigerator even up to 4 or 5 weeks without adverse effect, and still be deliciously good if it is first picked when the corn is still very young and tender. A second pick will result in higher sugar content. Garvin explains that the corn and lettuce they grow is not considered ‘organic’ because they cannot get organic seeds, but the methods for growing them are organic based. The Goodes also experiment with different growing techniques. 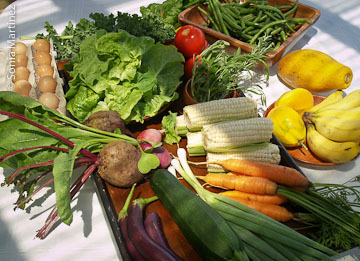 They grow corn, beans, carrots and beets the traditional way; tomatoes, cucumbers, squash and eggplants grow in greenhouses; lettuce is grown in a hydroponics system; and they use raised beds for kale, chard, onions, squash, parsnips, radishes and also for carrots, beans and beets. Besides the crops mentioned above, the Goodes also grow apple bananas, breadfruit, avocadoes, papayas, lemons, limes, oranges, and 2 varieties of liliko’i (one being the sweeter ‘Jamaican’ variety which feels to the touch like a slightly fuzzy apricot). Herbs include thyme, sage, oregano, basil, rosemary and chives. Garvin is experimenting growing asparagus, broccoli, and artichokes. He has been able to harvest enough asparagus for their own family’s use, but hopes to be able to increase production soon. The CSA service started two years ago and subscriptions run for 8 week sessions at $200 plus tax each. Delivery is available weekly throughout Hilo “from the Singing Bridge to the Zoo.” Other area residents can pick up their subscription order at the farm each week. The usual mixture of products to subscribers is some of anything they have ready to harvest and not necessarily a set number of products. Some weeks might have a greater variety than others, but on weeks with less variety they make up for it by adding a bit more of whatever is available. On the day of our visit the mix included apple bananas, papayas, Jamaican liliko’i, green beans, radishes, carrots, beets, kale, chard, Japanese eggplants, corn, zucchini, green onions, lettuce, oregano, sage, thyme and chives. Fresh eggs from their own layers are optional. Last season was a good one and the Goodes expect the next one to be even better. Their main form of advertising is by word of mouth and through the Local Harvest website – www.localharvest.org. Plans are afoot to open a vegetable and fruit stand where their property adjoins Highway 19 (Mamalahoa) sometime in the near future. 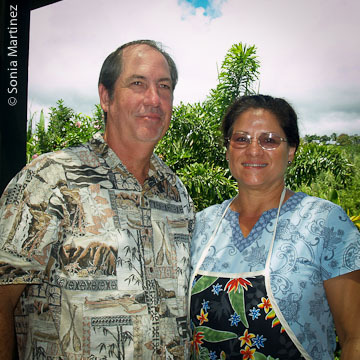 “We are hoping that our Island will think about where their food comes from and will want to buy local, food less traveled, supporting their local farmer/neighbor, keeping the money flowing on the Island. 90% of all food and produce are still coming from the mainland. We want to reverse this” says Garvin. “Support your nearest CSA and your local farmers”. Subscriptions available for $200 plus tax for an 8 week season. Eggs, one dozen per week for the 8 weeks, are an additional $32.00 plus tax. Deliveries are on Wednesday between 9 am – 3 pm for most Hilo residences. Other subscribers pick-up at the farm after 3 pm, also on Wednesdays.